Helskanki - Nikata (Quextal remix) is now available to buy on Beatport! DBF - Going Back (Quextal remix) is still available from Beatport and Juno. 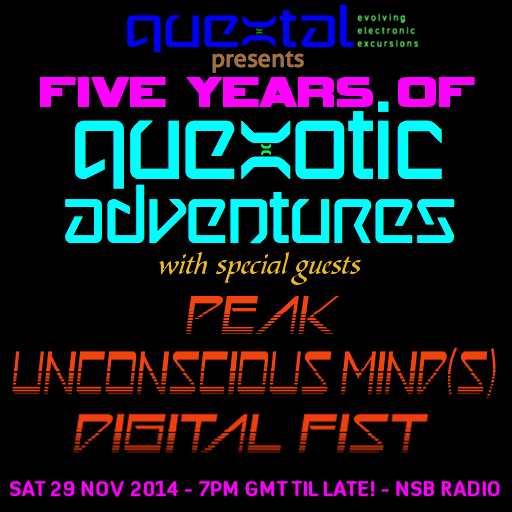 Quexotic Adventures on NSB Radio (mainly psybreaks, progressive breaks, drum & bass and other broken beats) - 1900-2100 (UK time) usually on the first and third Saturdays of every month. Tales Of The Interstitial on Psymusic Radio (progressive, psytrance, techno, psybreaks, basically any genre as long as it's trippy!) No specific regular slot - see the Contact page for how to find out about forthcoming shows. If you're looking for CD-length demo mixes without any talking, they're under Promo Mixes. If you want to contact me for bookings, remixes etc, details are on the Contact page. To keep up-to-date with the latest mixes and news, follow me on Facebook, Twitter, and Soundcloud.